“Hati hati”. In the roar of the thrashing sea, I could hear the squeal of Agung Kesawa, the Balinese guide. I was standing on a cliff, mesmerized by the ebony stones that arch at Tanah Lot, Bali’s most famous temple that juts into the sea. Before I could mutter a prayer, a giant wave battered my stilettos and left my crinkled skirt limp. “Hati, hati, it is high tide, it will devour you”. I heard Kesawa’s squeal again. The salty sea had turned me teary and in the haze all I could see was Kesawa and his traditional ikat kain (sarong) and peci (felt cap). Ah, I was not dead. Not dead like the duck that a devout had just thrown into the water to appease the sea god. The duck was helpless – the devout had tied heavy stones to its dainty orange feet. The irate sea devoured the duck. In Bali, I was alive. Be careful. That’s hati hati in Balinese. Still drenched but delighted to be alive, I was trying to perfect the typical Balinese inflexion when Kesawa almost tripped on a wanton pebble. “Hati. You will get hurt”. It was my turn to squeal. Kesawa guffawed. “Talking of liver?” His retort left me flummoxed. “Hati hati is ‘be careful’, but hati is ‘liver’”. I stood corrected. In Bali, think before you get stingy with combo words – like, one kacang is peanut, kacang kacang is a fish with a large snout. These tedious lessons could wait, I had to first thank the gods for giving life another lease. But in the Island of the Gods, my piety was riddled with myriad options – there are 20,000 temples in Bali and I knew not where to genuflect. Perhaps I could just head to the peak of an active volcano and beseech the lords, I mulled. As the car sped past lush rice terraces, countless Buddha sculptures polished and gleaming for a buyer, a colossal statue of Lord Krishna with Arjun on the chariot, rows of rattan furniture shops, antique doors stacked tidily by the roadside, baskets of jackfruits and miles and miles of palm fronds swaying in the breeze, I thought of Mount Batur that has erupted 24 times since 1800. As the car swerved uphill towards Kintamani, I noticed lava strewn on the edge of the streets – I was not surprised; the last eruption was roughly 40 years ago and neighbouring villages are still rife with stories of burning lava hurtling down the mountain and villages turning into handful of ash in the smouldering fire. Holding on to the rails of the viewpoint, I saw Batur’s peak far away in the horizon, its foot hemmed by an azure lake. I was awestruck by the verdant panorama; it seems as if the gods had hunched overtime with their shovels to dig the lake. Before stepping into Bali , I had made a resolve – in the island I would stay away from the sphere of banal woes and clichéd delights. The bikini could stay languidly in the closet and the surfboard could gather dust in the attic. I was in no mood for another tan or a ride on the waves. I was in no mood to repeat what Elizabeth Gilbert did in Eat, Pray and Love either. I was not following Gilbert’s trail. Naah! Who wants to repeat Gilbert? I sure was neither looking for a balance between ‘eat’ and ‘pray’ nor ‘love’ for that matter. Not in Bali . Instead, I decided to be a tiger - a snarling tiger, the protagonist in the traditional Reog dance. I could wriggle into a furry sheath, shake a leg, wear the colourful tiger mask, perhaps growl too. But the thought of holding the 50-kg tiger mask solely with my teeth was certainly daunting; I smiled at the imagined tumble on the dance floor or going toothless with the mask’s weight. Not forgetting that I was born with two left feet, I stuck to the safer option and sat in the audience to watch the Barong dance that draws thousands of aesthetes to Bali. A dance-drama, Barong narrates the fight between good (Barong) and evil (Rangda); the evil spirits killing themselves with their poisoned keris (asymmetrical knives). 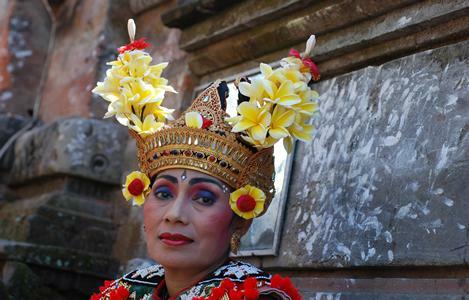 Barong is a sacred temple dance with women in intricate head dresses woven with champa flowers; their moves so elegant and supple that sitting on the rugged stone steps of the courtyard, I wondered if they have nary a bone to count. As evening started to meld into night and shadows started lengthening, it was time for more shadows in Ubud, Bali’s cultural hub, where shadow puppets narrate stories behind lit screens. These are no ordinary puppets, they are ‘brought to life’ by special ceremonies by the dalang (the puppeteer) and said to possess spiritual powers. As the thud on the gong interrupted the silence, the cymbals clanged and the demon with splayed legs hurried towards the angel, I held on to my breath. In Bali, I wanted the angel alive. In Bali, I wanted my joy to live forever. Perhaps, in Bali, the gods in the 20,000 temples were listening!